An amazing visualization tool... Free, on the web, and it works in your favorite web browser. It's called “earth”, and it lets you look at winds, temperature, humidity, pollutants, ocean waves, and more – and you can see them anywhere in the world. It's all driven by satellite data, and much of the data is updated in near realtime (within a few hours). The least fresh data I could find was at most five days old. You can even look at the data with a variety of map projections. Amazing to have this at your fingertips! 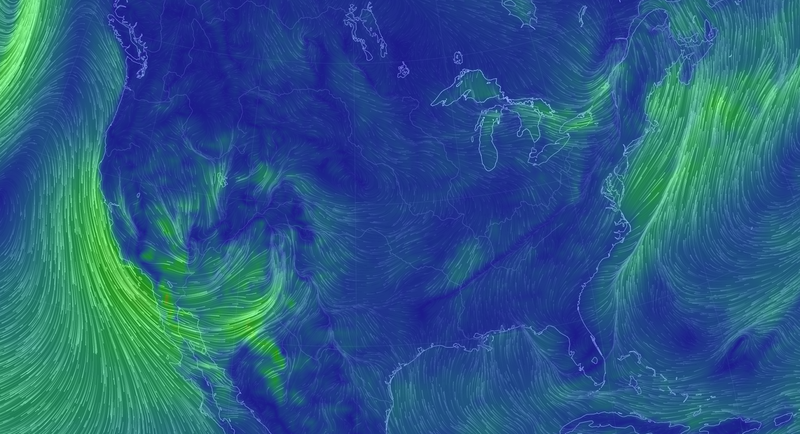 I took the screenshot at right this morning, showing the winds over the U.S. At first I thought that winds were all it could show, but then I clicked on the “earth” menu at the lower left corner, and a whole 'nother world opened up. Take a gander! Windyty (https://www.windyty.com/) is pretty good to. I think it performs a little bit better and you can enter cities, airports to get specific forecasts.